Sacrilege! A monument of bourgeois concert-hall culture is demolished! Where art connoisseurs normally contemplate the depths of their own souls to dark, romantic sounds, there now remains no room for sentimentality. 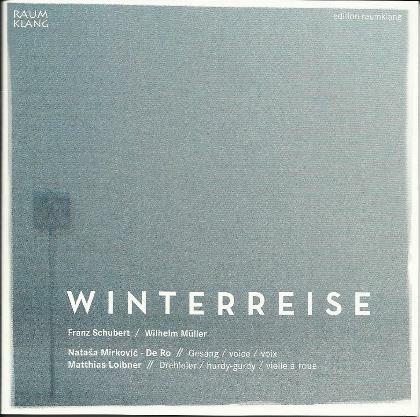 For the Winterreise (“Winter Journey”) in the version by Natasa Mirkovic - De Ro and Matthias Loibner is a skeleton. It leads the text and the music back to the essence, to an attitude that oscillates between laconism and pathos, and was already conceived in this ambivalence by Schubert. Man as the plaything of the emotions, as sufferer of fate and simultaneously as its sovereign – a Romantic topos that is often enjoyed with piano-beclouded melancholy. 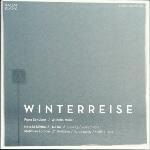 This Winterreise doesn’t give him a chance. It is bold and direct, present, and at the same time fragile, an approach to the poetry that could hardly be more honest. “Strange old man, shall I go with you? The combination of Schubert’s Winterreise and the hurdy-gurdy came about quite naturally through the “Hurdy-Gurdy Man,” who in the last song of the cycle is usually understood as an allegory for insanity, death, or torpor. The constant flight of the lyrical self from the inner turmoil to a yearning (for death and love), whose real insatiableness becomes perceptible in Schubert’s setting, has from the very beginning fascinated me in the texts of Wilhelm Müller. musical foreboding. So the end of the Winterreise becomes the point of departure, and in this way pushes the dissatisfaction and loneliness into the foreground of this version for voice and hurdy-gurdy. The disappointment and the wish to hold fulfillment firmly in both hands – this image of inner turmoil manifests itself in Müller’s words and in Schubert’s setting from 1827, the year of Müller’s death. In an unparalleled spiritual kinship, both immersed their yearning in their respective art in order to say one thing in two ways. A unison of emotions flows in every line and in every musical phrase. Graz stage director Ernst M. Binder’s idea awakened in me an enthusiasm and an irresistible magical urgeto embark on this journey through this winter of the emotions. And already after a few of Müller’s words and several of Schubert’s tones, the need arose to tell of these emotions, fragile and naked and freed of unnecessary decoration in order to serve the listener, by means of the voice, as a mirror, and to let him/her share in the intimate communication between Müller and Schubert, which uniquely shines from the depths through the whole cycle.